As professional learning communities become more widespread, educators have learned that they can’t simply form grade-level or subject-area teams and call it a day. To profoundly affect teacher practice and student learning, PLCs need strong and knowledgeable leadership. Strategies for facilitating interactions among colleagues in PLCs and building trust and buy-in. Field-tested, user-friendly protocols to focus and deepen team discussions around texts, data, teacher and student work, teacher dilemmas, and collaborative planning time. Tips for anticipating and addressing interpersonal conflicts and obstacles that commonly arise during use of protocols. Current and prospective PLC facilitators at every grade level will find this book an essential guide to navigating the challenging and rewarding endeavor of leading authentic PLCs. Build your skills, and help your team rise to the next level. 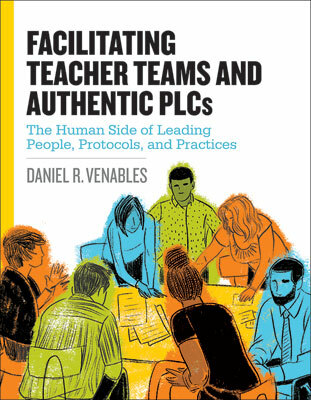 Daniel R. Venables is an education consultant and the founding director of the Center for Authentic PLCs, an organization committed to assisting schools in building, leading, and sustaining authentic PLCs.